Yesterday, we told you why colleague Teeka Tiwari expects bitcoin (BTC) to shoot higher before the end of the year. 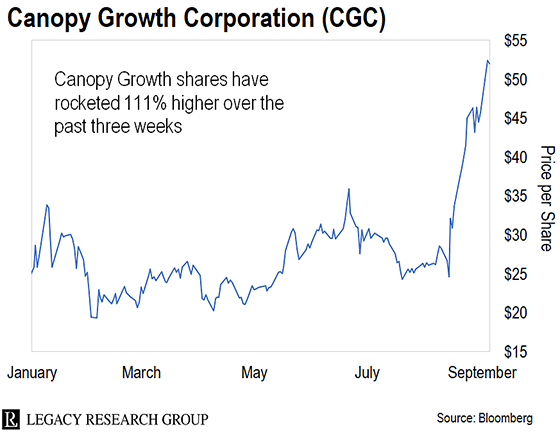 Today, we’re putting another profit trend from the Legacy Research team on your radar – the surge in legal pot stocks. As you’ll learn below, legal pot stocks have been on fire lately. But there’s still plenty of upside ahead… as cannabis moves out of the shadows and becomes a fully legal industry. In August of last year, colleague Nick Giambruno recommended the U.S.-listed shares of the Canadian company to paid-up subscribers of our Crisis Investing advisory. Since then, shares in Canopy are up 650%. And it’s not the only legal pot stock that’s popping in the Crisis Investing model portfolio. The average gain for the eight legal pot stock recommendations Nick has made over the past two years is 132%. To fill you in real quick, on August 15, Constellation Brands – the maker of Corona and Modelo beer – bought 104.5 million shares in Canopy Growth for $4 billion. Constellation plans to develop cannabis-infused drinks with Canopy. It’s not the only Big Alcohol company to hitch its wagon to the cannabis legalization wave. Molson Coors – which makes Coors beer – is developing a non-alcoholic cannabis infused beer with Quebec-based pot grower The Hydropothecary Corporation. And just this week, news broke that Diageo, the Smirnoff and Johnnie Walker maker, is in talks with three Canadian pot companies to produce cannabis infused drinks. That’s why you’re seeing cannabis stocks shoot higher. Investors know these deals mark the start of a flood of investment dollars into legal cannabis companies. But as Nick has been telling his readers, there’s an even more important development on Capitol Hill. The president has called the Democratic senator from Massachusetts “goofy” and “the fake Pocahontas” (a jab at her claim that she has Native American ancestry). But these political foes agree on one thing – Washington needs to respect state laws on legal cannabis. STATES stands for Strengthening of the Tenth Amendment Through Entrusting States. It’s the name of the bill Warren – along with Senator Cory Gardner, a Republican from Colorado – introduced to the Senate in June. The Tenth Amendment says Washington can declare war, collect taxes, and regulate interstate business activities… but that outside of these areas, it’s up to the states to make and enforce their own laws. This couldn’t be more important for the legal cannabis industry. Cannabis is legal for medical use in 30 U.S. states, plus Washington D.C. And it’s legal for recreational use in nine states. But it’s still illegal at the federal level. That means the feds can shut down cannabis businesses state voters have sanctioned. And legal pot companies have trouble accessing the federally regulated banking system. If the bill passes, big corporations can invest in state-sanctioned cannabis businesses without fear of federal prosecution. It also means cannabis companies can access the banking system and the financial system. As it stands, most of them are cash-only businesses. Most national banks won’t take on legal cannabis-related businesses as customers because, at the federal level, cannabis is still illegal. And national banks are regulated by the federal government. In late June, the U.S. Food and Drug Administration (FDA) approved Epidiolex, the first cannabis-based drug, to treat severe forms of epilepsy. And after 81 years of federal prohibition, Congress is poised to legalize hemp – a close cousin of the kind of cannabis that gets you high – with bipartisan support. The most recent polling reveals that more than 64% of Americans are in favor of cannabis legalization. The tide has turned on this. Canada legalized cannabis this year. It’s now inevitable that the U.S. will do the same. Still, most of Wall Street hasn’t come to terms with this yet. That’s why this is such a huge opportunity. It’s why I’ve been telling readers that investing in the nascent cannabis industry today is like investing in the alcohol industry at the tail end of Prohibition. You’re getting into a massively profitable industry at the ground level. If Nick is right, this is a trend you want some exposure to. Just keep in mind that – like cryptocurrencies – these stocks are volatile. So don’t bet the farm on this idea. In Monday’s Daily Cut, we posed the questions: Is there a line between free speech and hate speech? Should the feds step in when that line is crossed? The line between free speech and hate speech is coercion. “Sticks and stones may break my bones, but names can never hurt me,” says the grade school adage, and it’s true. When speech is backed up with coercive force, it becomes hate speech. Radical Muslims expressing disdain for other systems of belief is not hate speech until it’s enforced with terrorism, jails, and war. 9/11 was hate speech. But hate speech includes when it is the state that supplies the coercive force. The refusal of a baker to decorate a cake for an ideology that offends him is not hate speech. When the critics in and out of the Deep State fine him and attempt to destroy his business, that’s hate speech. Simple answer, NO. All speech is protected. Actions should be prosecuted if beyond the law, but all speech is protected. Hate speech is not a crime, hateful actions probably are. After serving in the military for more than 30 years my view is that it is even more important to protect the speech no rational person would agree with. Otherwise the power of the “majority” is directed towards policing the thoughts of some minority – which inevitably leads to state-enforced discrimination (based on what someone thinks) and even worse persecution when specific non-majority thoughts become illegal. It’s a slippery slope downhill from there. During the Russian revolution local “people’s committees” had summary execution power over people who didn’t “think” appropriately. Given the passion on either side we would be foolish to think that it couldn’t happen again if one side or the other were given the power to make it so. Our Founders must have been inspired by divine providence to have enshrined a system (in the 1780s!) where speech (thoughts) is beyond the power of the state. The simple answer is NO, all speech is protected in America. Logically, I don’t see how there could be a line between free speech and hate speech. Everyone is free to speak, but no one is obligated to listen. Should we choose to listen to speech that is hateful? No. But that is the potential hearer’s choice. Should someone have authority to silence the speaker? No. However much you or I may wish the alleged hateful speaker would not have those feelings or say those things, the fact is they do have them. Though the feeling of hate may be intense, it is still verbal expression of a feeling. Aren’t we supposed to talk about our feelings? My parents taught the familiar rhyme “Sticks and stones may break my bones, but words will never harm me.” Mr. Rogers says: Anything that can be talked about can be managed. When there is harmful action or incitement to violence, a free society must act to protect the target. There is, however, no right or protection to not have your feelings hurt based on another expressing their own feelings in speech. If they use their free speech to purport “facts” about you or any group that are demonstrably untrue, they expose themselves to committing libel (if written) or slander (if spoken) and are responsible for the legal consequences. Free speech is the right to express your opinion, no matter how stupid or wrong or hateful it is. The non-liberal liberals want to make sure nobody expresses an opinion they do not like. Anything which even slightly offends the most easily offended of the liberals has to be labeled hate speech so that there is a reason for them to ban it and protect their sheltered opinions. The reason they have to be sheltered is because if you asked the liberals what is so objectionable, it is usually something that normal people could overlook. They cannot formulate any rational reason for their tenderness and that is why they must fly into rages and demand their rights to their opinion. Just another 2-year-old having a tantrum. Pity that a whole generation suffers from this madness. I live in Australia and our government has been passing laws, forcing us into not much better than a police state. Legislation is before our Senate committee which could jail me for writing this, because I would be regarded as embarrassing the government. It’s outright scary what is going on… all in the name of catching terrorists. We don’t have safeguards like your First Amendment. I feel it will get worse before it gets better. I deleted Facebook, refuse to use Twitter and quite frankly, I’m thinking of returning to snail mail for important correspondence. It is curious to me that most references to internet privacy concern whether one has something to hide. Most people don’t realize this, but we all have something to hide. Our system, as distorted as it is, is designed so that each person can be prosecuted by the government, if need be, when they move too far outside of government dictated norms. With the advent of conspiracy, aiding and abetting, perjury, money laundering, tax evasion, obstruction of justice, and the like; each and every person in the United States has something to hide. An unchecked internet system simply facilitates a cost-effective system of tyranny through surveillance. I’ve been following The Wall Street Journal and The Economist on what is happening in Xinjiang, China with the Uyghurs. It is hideous what the Chinese government is doing with these people and they are also reaching into other countries to track their relatives and manipulate them. It makes me wonder if we should be doing business at all with Beijing. I also wonder why other mainstream newspapers are fooling around with “junk” news and ignoring this major event. The ‘State’ at this point is only interested in protecting multinational corporations, their intellectual property and patents. The ‘State’ is not interested in protecting the individual citizens. If the ‘State’ were concerned with protecting the individual citizens, just ask why they haven’t created any civil defense for the citizens. Yet, Russia has done so in at least Moscow. I traveled there all the time in business and actually was shown one. That’s when I asked myself why our government had not done this a long time ago also. No. 1 is my privacy, liberty, and private property. The threat of terrorism is a very low priority. The threat from the US government has a far higher probability. The First Amendment is under assault by those who want to control your life. In my profession it is now impossible to get a job without a social media background check. I know colleagues who have been terminated for negative posts by OTHERS! My company requires an affiliation with a certain social media company under pretext of disseminating info. I refused and dared them to fire me. Lots of folks think they know best. Liberty is dying. The republic is at risk. I fear that some of your readers are sleepwalking into a world where government and bureaucrats determine what is acceptable to think and to say. Some of your other readers appear to be cheerleaders for the cause. Rights, privacy, and civil liberties are eroded incrementally over time. It’s been going on for years. Back in the late 1990s and the early 2000s, I wrote on these kinds of issues and developments for the Sovereign Society and for Zurich Club among others. Back then it was Menwith Hill and the Regulation of Investigatory Powers Act. Now it’s the Internet and Facebook and facial recognition technologies. The cast of characters and the tools might have changed, but the objective remains the same: total power and control over the individual. Slowly but surely, they are getting there with the help of the sleepwalkers and the cheerleaders (useful idiots). I am loving the coverage. Want to share your story, too? Email us at [email protected]. And don’t forget to check your inbox for our Friday mailbag tomorrow. Our Legacy Research experts will answer many of the questions you and your fellow readers have sent in.